Acclaimed Portland-based architecture firm Skylab Architecture worked with Contractor Skanska USA Building to complete yet another impressive sustainably designed building. The Columbia Boulevard Wastewater Treatment Plant is a new 11,490 square-foot facility that will provide office space for 36 engineers and a visitors reception area for public interface. This design not only employs clean modern design, but it also channels stormwater through a green roof system, making it out as one of the most progressive facilities of its kind. The Columbia Building is an educational demonstration of sustainable building techniques. Designed in a radial fashion to track the sun, this single-story concrete building folds seven cast-in-place concrete roof forms to channel the stormwater down a green roof system into a swale and back into the Columbia Slough. The saw-tooth roof form also allows for the building to be flooded with natural light, while the jagged façade has a series of stainless steel solar shades over the clerestory windows to modulate the light throughout the day. Skylab Architecture’s design was “inspired by native landscape and its industrial past … (and) is an elegant combination of landform, indigenous planting, formal geometry, and durable construction systems”. Other sustainable systems included in this elegantly dynamic design include a heat pump mechanical system that taps into the plant’s processing water source for heating and cooling, a photovoltaic system, an onsite co-generation plant, and a central green space. Skylab Architecture provided the City of Portland Bureau of Environmental Services with a wonderfully scaled facility that adds creativity and public education to the wastewater service industry. Designed in a radial fashion to track the sun, this single-story concrete building folds seven cast-in-place concrete roof forms to channel the stormwater down a green roof system into a swale and back into the Columbia Slough. In the cold and cloudy climate of Portland the clerestory windows in the Columbia Building will help reduce energy costs associated with lighting. 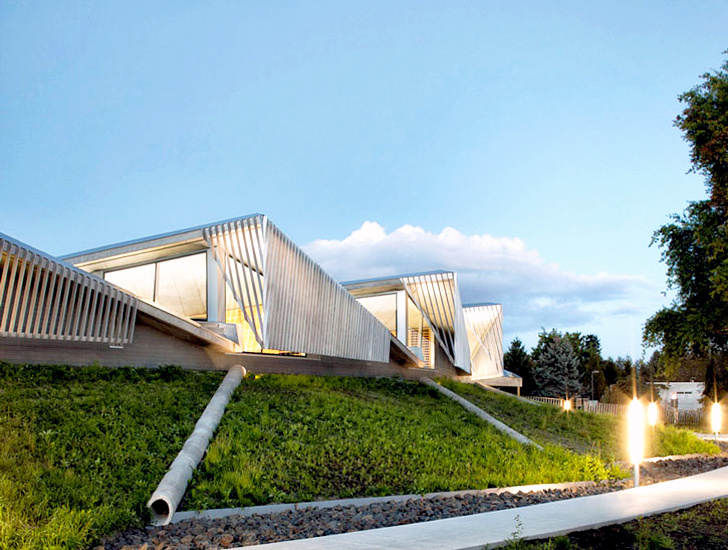 A jagged façade helps to reflect the landscape of the site. This jagged façade has a series of stainless steel solar shades over the clerestory windows to modulate the light throughout the day. Skylab Architecture provided the City of Portland Bureau of Environmental Services with a wonderfully scaled facility that adds creativity and public education to the wastewater service industry. The saw-tooth roof form also allows for the building to be flooded with natural light. The Columbia Building's interiors are clean and modern. The energy efficient lighting of the office space is nicely combined with natural daylighting. The new Columbia Building adds a public face for the plant, programming generous visitor reception and public meeting space along with office space for engineers and construction management staff. Other sustainable systems included in this elegantly dynamic design include a heat pump mechanical system that taps into the plant’s processing water source for heating and cooling, a photovoltaic system, an onsite co-generation plant, and a central green space. 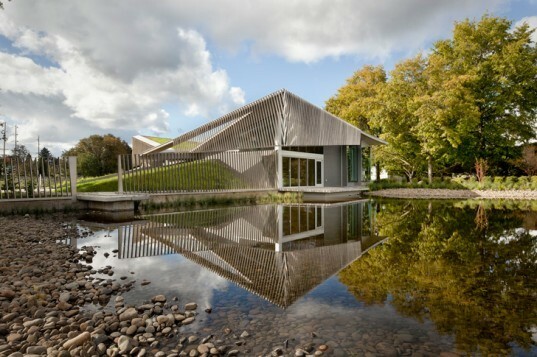 Inspired by the native landscape and the site’s industrial past, the building is a combination of landform, indigenous planting, formal geometry, and durable construction systems.